More than 80 Alberta companies are expanding their global export opportunities thanks to the Alberta Export Expansion Package’s programs. In addition, over 100 more will see further support to get their exports rolling this month. Alberta’s small businesses can now apply for funding to help develop a targeted international market entry strategy. Alberta Innovates will administer the newly launched Export Readiness Micro-Voucher Program, which will connect export experts with local businesses to develop strategic plans to enter new markets. The Government of Alberta has also supported more than 15 seminars and events to help small businesses learn about export opportunities and government services available to support their international business initiatives. The Export Readiness Program follows the October 2016 launch of the Export Support Fund. The Export Support Fund provides small businesses with up to $20,000 for a variety of export expansion activities throughout the world. More than 80 Alberta businesses have already been approved for funding through the program. 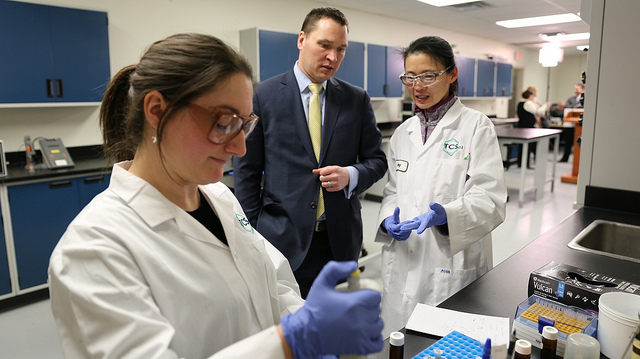 Eleven companies used this support to participate in Alberta’s largest ever trade mission, led by Economic Development and Trade Minister Deron Bilous in November. We are very thankful for the financial support of the Alberta Export Expansion Package. The Export Support Fund provided encouragement for us to explore international markets. We participated in the 2016 Alberta Trade Mission to China in November and established valuable partnerships with new clients, companies and potential investors.”John J. Yao, CEO, TC Scientific Inc.
Alberta small businesses planning or considering new international export activities can apply for government funding through the Export Support Fund and the Export Readiness Micro-Voucher Program. The third and final program in the Alberta Export Expansion Package, the Global Buyers and Investors Program, is bringing qualified buyers and investors to Alberta and connecting them with Alberta export-ready companies. Updates on that program will be released in coming months.